« What does that weather warning mean? 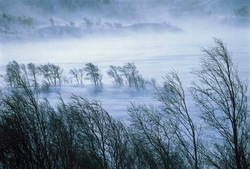 Winds in the winter can be one of the most frustrating and dangerous weather conditions. What causes them and how can you protect yourself? As we have experienced in the last 24 hours or so, high winds in Colorado can cause conditions to deteriorate rapidly. They present a very real danger to life and property, especially when coupled with other winter conditions like snow. Why does it seem like we get so much wind in the winter? What causes this? How can you prepare and protect yourself and your property? In this third in a series on Winter Weather Preparedness from the National Weather Service, ThorntonWeather.com helps you understand why we receive so much wind and how to prepare for it. Governor Bill Ritter has proclaimed this week through October 25th as winter weather preparedness week in Colorado. This is an excellent time for all individuals, families, businesses, schools, and radio and television stations to review their winter weather preparedness plans. Two main causes of high winds in Colorado during the cold season are the air pressure difference between strong low pressure and cold high pressure systems, and Chinook winds developing along the front range and mountains in the eastern half of the state. A strong low pressure system in Colorado, coupled with a high pressure system to the west, can send a cold wind, called a Bora, through the western part of the state and down the slopes of the eastern mountains. The result can be a cascade of high winds from the west or northwest into the adjacent plains at speeds over 100 mph. The damage caused by this event is usually much more widespread than that caused by a severe thunderstorm in the warm season. Jet stream winds over Colorado are much stronger in the winter than in the warm season, because of the big difference in temperature from north to south across North America. Very swift west winds, under certain conditions, can bring warm, dry Chinook winds plowing down the slopes of the eastern mountains. These winds can also exceed 100 mph in extreme cases, again bringing the potential for widespread damage. Winds of 60 to near 100 mph are possible in and near the foothills in the Fort Collins, boulder, Denver, Colorado springs, canon city, Westcliffe, Walsenburg and Trinidad areas. The area around boulder is especially prone to these extreme wind events. Dangers from high winds include flying debris, collapsed structures, and overturned vehicles. The national weather service will issue a high wind watch when there is a 50 percent or greater chance for high winds to develop in the next few days. When the threat becomes more certain in a specific area, a high wind warning will be issued. Cold strong winds can also bring dangerously low wind chill values, prompting a wind chill advisory or wind chill warning. If high winds are forecast for your area, it is a good idea to bring lightweight belongings indoors, or tie them down or move them so they do not become dangerous missiles. Any downed power lines should not be approached, instead call the utility company. Stay clear from buildings under construction during high winds. They can easily collapse. Traveling on north south roads near the mountains during a high wind event can also be dangerous. If you drive a lightweight or high profile vehicle, you may want to wait until the high winds subside. This entry was posted on Wednesday, October 22nd, 2008 at 1:13pm MDT and is filed under Colorado Weather, Thornton Weather, Weather Education. You can follow any responses to this entry through the RSS 2.0 feed. You can skip to the end and leave a response. Pinging is currently not allowed. This is an extraordinary series you are running. Thank you to ThorntonWeather.com and the National Weather Service for making these available.